Ireland Chauffeur Travel is a family owned and operated business based in Cashel, Tipperary and my first recommendation for a driver guide in Ireland. We are a family business with three members of the same family working directly in the business. We started doing small groups of two and four persons (mostly couples) and as our business grew we developed more for family tours as families love to travel together and nowadays multigenerational travel is very common to Ireland, especially from the USA. The guide is great for the parents and grandparents as he takes the pressure not just off the driving but also the decision making so they have more time just to relax and have fun – which is what the travel is all about. Ireland Chauffeur Travel are moving towards more experiential family tours which involve activities such as hiking, biking, walking and horseback riding. We also arrange cookery demonstrations, pottery making, sheep dog demonstrations, so the family leaves Ireland relaxed and also educated as to the culture, lifestyle and skills of the people. We also book the best places to eat, drink and listen to music as well as recommend shopping and hard to find places where clients can enjoy authentic experiences. Wondering if a driver guide in Ireland is right for your family? 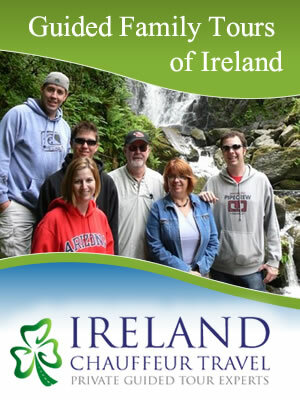 I invite you read about the Perry Family’s Ireland Vacation with Ireland Chauffeur Travel. Want more information? Contact Ireland Chauffeur Travel via their enquiry form or email Michelle Lee, Ireland Family Vacations’ personal consultant, directly at michelle@irelandchauffeurtravel.com. TIP: include code IRFV2019 in your message to receive a 5% discount on your tour price + a family hamper of picnic goodies to enjoy during your trip!